Vincenzo Nibali‘s dominance of the Tour de France continued on the hors catégorie Chamrousse climb this afternoon as he soloed to win his third stage of this year’s race. Nibali attacked NetApp-Endura’s Leopald König and Rafal Majka (Tinkoff-Saxo) 3.2 kilometres from the top of the climb to win by 0-10. The day’s biggest loser was Sky’s Riche Porte, who finished 8-52 behind Nibali, and slipped from second out of the top 10 on GC. This was another hot, and aggresive day of racing. Giovanni Visconti (Movistar), Alessandro De Marchi (Cannondale), Blel Kadri (Ag2r), Jack Bauer (Garmin), Tom Dumoulin (Giant), Kristjan Durasek (Lampre) and Daniel Oss (BMC) went clear 15 kilometres in after a number of moves had been neutralised. Bauer was quickly dropped and Dumoulin punctured, before Bartosz Huzarski (NetApp) and Brice Feillu (Bretagne), then Jan Bakelants (OPQS) and Rudy Molard (Cofidis) bridged to the leaders. Their maximum advantage was 4-55 as Katusha, the team of King of the Mountains leader Joaquim Rodriguez, controlled the pace in the peloton. At the bottom of the first-category Col de Palaquit climb, stage eight winner Kadri and former yellow jersey wearer Bakelants led the way, before De Marchi rejoined the duo and then passed them halfway up the 14.1-kilometre ascent. The Italian led the peloton by 2-40 at the top of the Palaquit, and even with the bunch slowing briefly on the descent after Nibali’s team-mate Jakob Fuglsang crashed, his advantage at the start of the 18.2-kilometre finishing climb had been reduced. Movistar led the peloton onto the climb in support of Alejandro Valverde, but inexplicably used three riders up in the opening three kilometres of the final climb. However, by that point Rodriguez, Sky’s Geraint Thomas as Michal Kwiatkowski (Omega Pharma-Quick Step) had been dropped from the yellow jersey group. Nibali’s team-mate Tanel Kangert picked up the pace-setting, and with 12.5km to go, Porte lost contact and with it any hope of a podium finish. 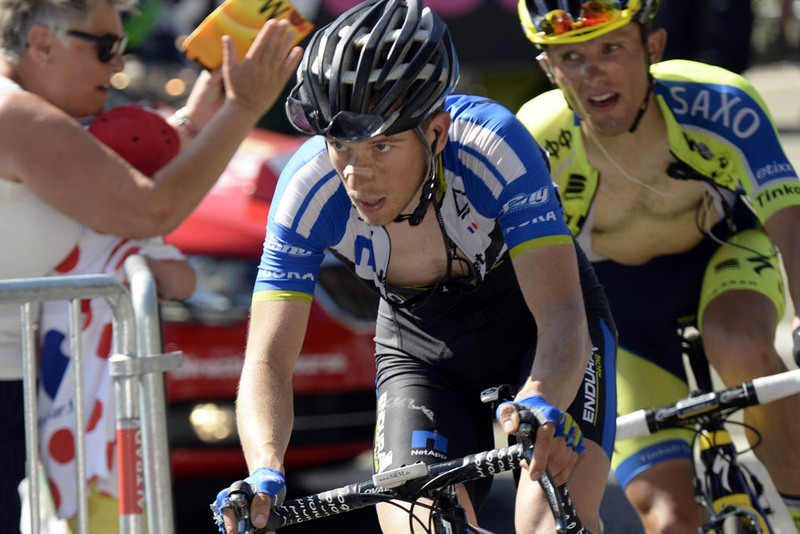 König attacked 11 kilometres from the finish, and was followed by Majka. Behind, Valverde accelerated and whittled down the chase, with only Nibali, Thibaut Pinot (FDJ.fr) and Laurens ten Dam (Belkin) responding. Nibali jumped across to the leading duo with a huge attack 6.6km out, before his pace saw him drop König and Majka approaching the finish. 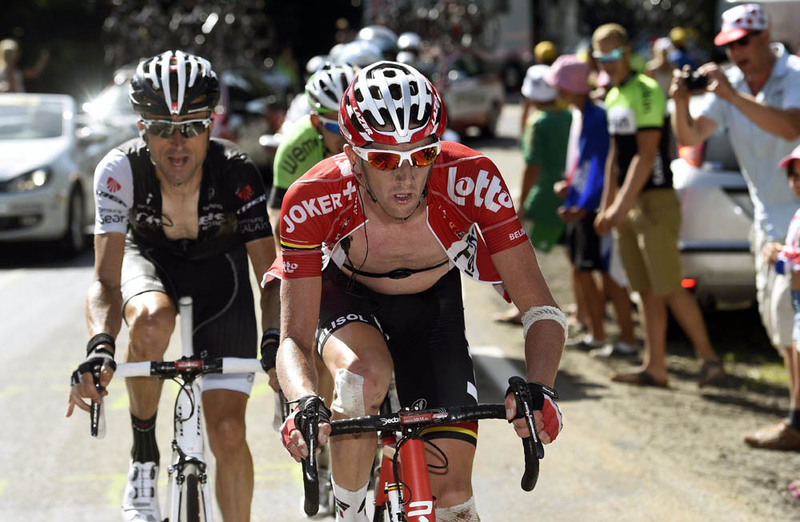 Valverde and Pinot engaged in a battle royale for fourth, which the Spaniard ended up winning. However, Pinot was unable to jump ahead of fellow French rider and white jersey leader Romain Bardet (Ag2r-La Mondiale) on GC, who moved up to third courtesy of Porte’s disastrous day. Nibali also took over the lead in the King of the Mountains competition with this victory.